Fr. John Shafik Botros was born on June 17, 1961 in Egypt. He earned a degree in Computer Science from the American University in Cairo. He came to North America in 1990 and worked for the government of Ontario in the Ministry of Transportation, Consumer & Business Services and the Environmental Tribunal. He served at Holy Virgin Mary & St. Athanasius Church in Mississauga, Archangel Michael & St. Tekla Church in Brampton, St. Mary & St. Abraam Church in St. Louis, Missouri as well as St. John the Beloved Church in Helmiet El Zeitoun, Cairo, Egypt. 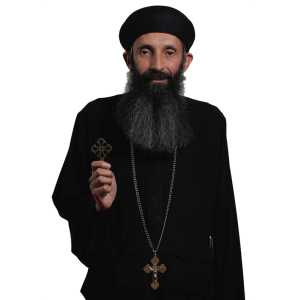 He was ordained presbyter by His Grace Bishop Serapion on November 5, 2006 and served at St. Mark Coptic Orthodox Church and Mission Center in Honolulu, Hawaii until 2008. He currently serves at St. George Church in Bellflower.